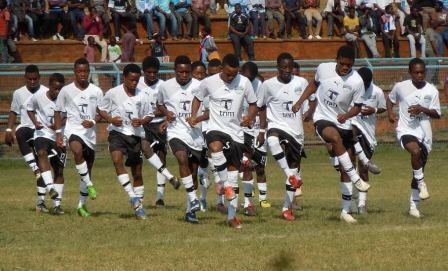 With only 4 games to wind up the 2015 Malawi Super League season, Fisd Wizards chairman, Blessings Tembo, has said that his team will not be relegated this season. Speaking ahead of their clash on Sunday with Azam Tigers, Tembo said the team will do all it takes for them to survive the chop in the elite league. “The team will not be relegated this season we will put a gallant fight for the team to survive the chop despite that we are ranked 15 on the table,” said Tembo. Fisd Wizards; Upbeat of survival. Tembo added that Fisd have now put all their efforts on the team’s hopes of surviving the chop. Out of the 15 Super League teams, five are fighting for their survival but three of them will be relegated out of the Tnm Super League this season. The five are Mzuni FC, Dedza Young Soccer, Epac FC, Airborne Rangers and Fisd Wizards. Meanwhile Mzuni coach has sent a strong warning to all the teams that are standing in their way that his team will try their best to beat them so that Mzuni should survive the chop. Panja ana amalira ndi mkodzo wawo womwe mafana achepa akayambileso. Paulendo waku nsenjjere, pitala makani, anawo apeza experience yomwe amanena ija,go thee well tiigawane team. U th best guys i lyk u! Yes anything is possible in futbol but time plays a big role in all circumstances!!! We Loved U but its too late for TEARS MJOJO!!!! I remain doubtiful for wizard. Their play is that which the world deserves…The Barcelonas have names bcoz they’re exposed on supersport otherwise much is reserved for 12 & 27th of this month. Cheating does not pay. Mponda cheated , kunzimva. These boys would have developed well at the academy. Just accept de situation, bak to whr u belong! what weed r they smoking down there,cant they c its 2 late ? Modern football is unpredictable. For sure Fisd can survive. The thing is they must concentrate on their fixtures without looking deep at others. kkk kma amfiti inu mwaganiza bwa??? is he prophet TB JOSHUA??? Why Not, Anything Is Possible In A Game Of Football. They Wil Stay. kkkkk blessing tembo or mike tembo? ?